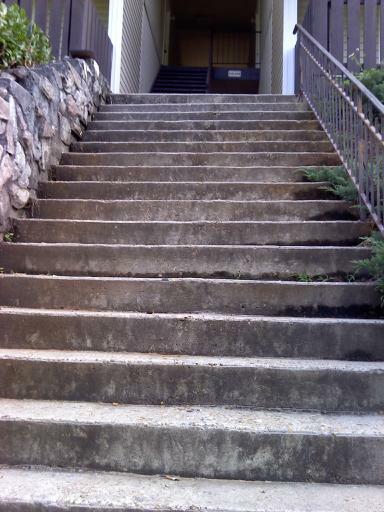 I have to walk up these monsters every day. I've fallen down my fair share of stairs. 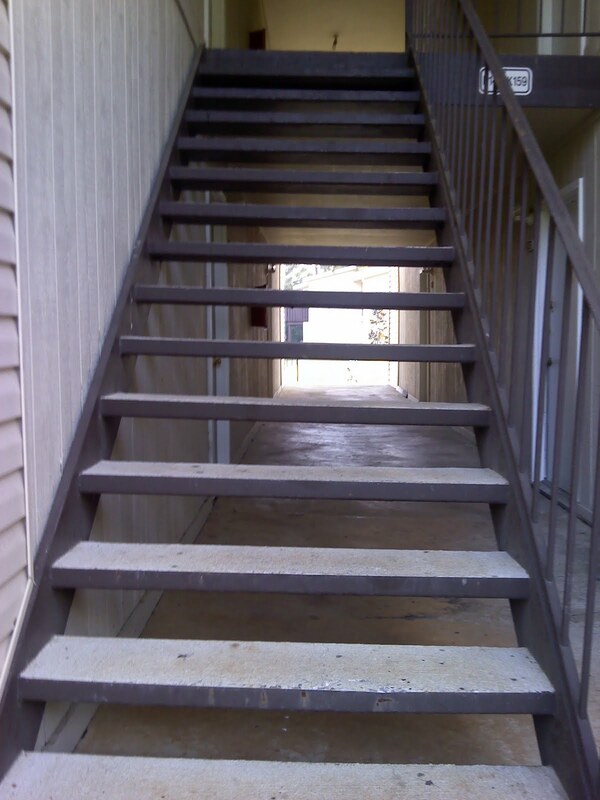 Once when I was little, I slid down my dad's backporch steps on my back. As cool as that sounds, it was not on purpose. When I was in 8th grade, I went on a church trip to Ruby Falls. To get to the lake you had to walk down these wooden stairs that had one flight that led to a deck and then another flight down to the beach. I missed the first step at the very top and rolled down to the deck and into the back of someone's legs. It was a good thing, too. If that person hadn't been standing there, I would have continued rolling through the deck railing and onto the rocks below. When I got home from work Wednesday night, I walked up my monster stairs only to realize I'd forgotten something in my car. So I turned around and began the descent. I made it down the top flight without incident [that's the one with a railing]. But when I was halfway down the stone stairs, something happened. Suddenly I was completely off balance. I missed two steps... then a couple more. I ended up taking a flying leap -in heels- over the last three, maybe four steps barely clearing the last. OMG, are you okay?? I hope you didn't break a bone or something. 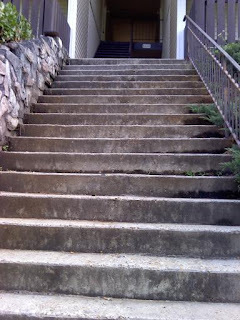 I'm sure you've heard the old admonishment, "watch that first step...it's a lulu!" Golly gee, Ashton, I'm glad you're okay! Your dangerous stairs remind me of my college film course and the famous "Odessa Steps" scene in the classic 1925 Russian silent film The Battleship Potemkin. Spolier alert: baby in a stroller rolls down the steps at the end of the clip. Please "watch your step" and take good care of yourself, Ashton. The world needs you! @Gnetch: I landed on my feet, and I must say I nailed the landing. But seriously I'm sorry you've got issues with stairs. If it makes you feel better, I think I'm going to die every time I get on an escalator. I'm not joking. I absolutely hate escalators. I refuse to ride on them.